Despite being one of the most unique places I’ve ever been, the islands of Socotra seem largely unknown to the rest of the world. 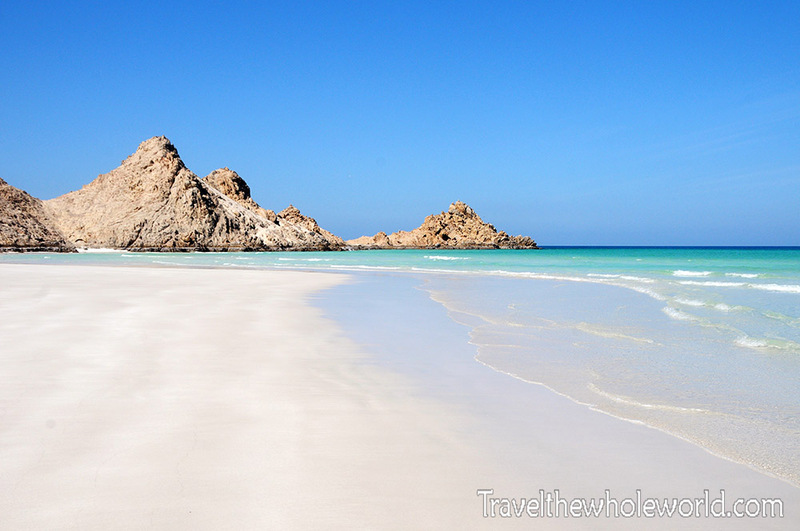 Socotra’s closest island to the mainland is just 50 miles northeast of Somalia, and 100 miles south of Yemen to whom they belong to. 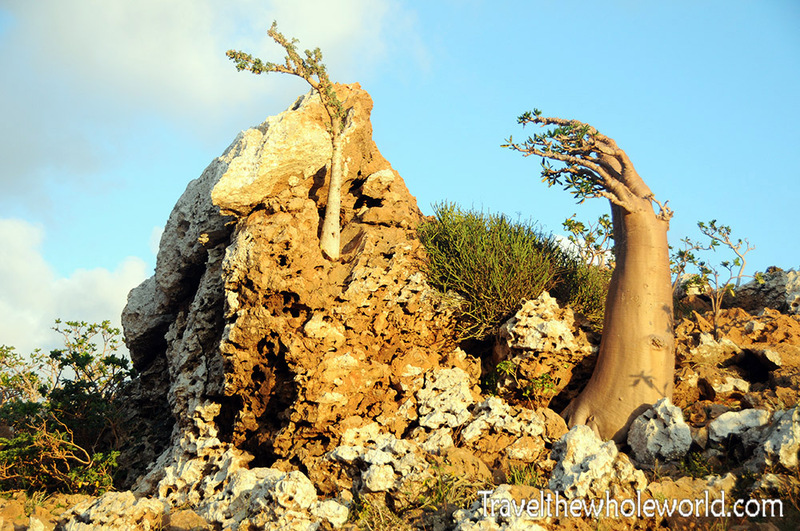 Like the Galapagos islands, Socotra stands out because over a third of its exotic plants and animals live no where else in the world. Even the native language of Socotri, that has no written form, is only spoken here! 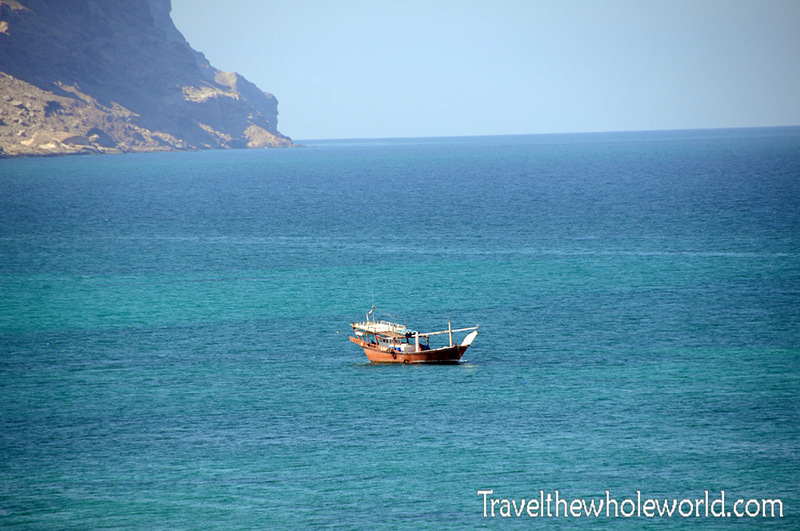 I flew from the mainland of Yemen to the Socotra’s tiny airport. Once I had grabbed my bags, I found my driver who was waiting for me and he greeted me be saying, “Hello, and welcome to the island!”. Above were my very first views of Socotra as we headed to the main town of Hadiboh, which you can barely see above the large rock on the upper left. 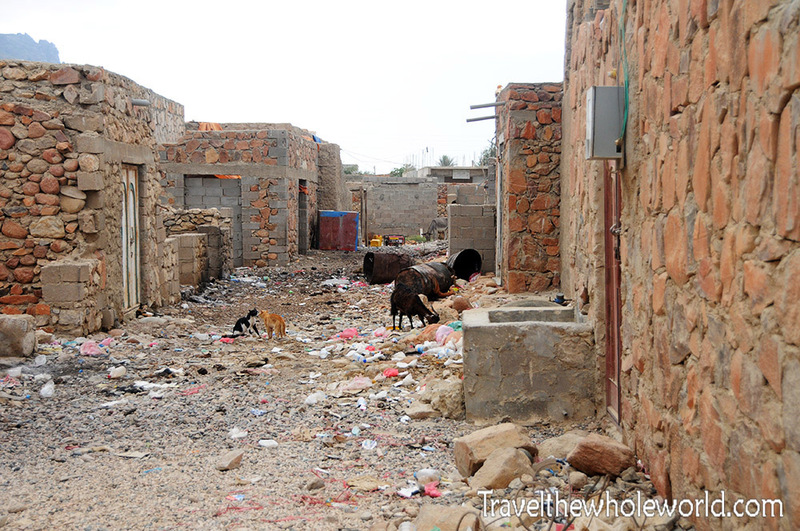 Unfortunately I can’t say there was really much worthwhile in the main towns of Socotra. To be honest, these were some of the trashiest places I’ve ever visited in my life, and its a shame that better care isn’t taken. The locals didn’t seem to understand the difference between throwing trash away in a waste barrel or the middle of a grove. Once during this trip when my driver stopped in front of some beautiful scenery, a man we had given a ride thought he’d repay us the favor by taking out all our trash out of the car and throwing it right out the window! 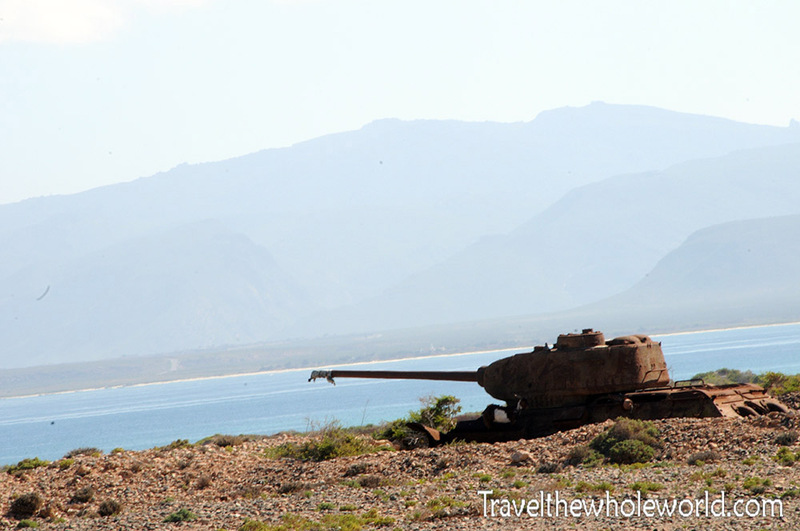 After I got over finding trash next to the towns, my next surprise in Socotra was finding tanks positioned all over the island. At the time I had no idea why they were here or if they were ever used. My understanding is that they are Soviet T-34 tanks, but I couldn’t find any history about recent conflicts that took place here. It seems like instead of using these as actual battle tanks they simply dug them along the coast and used them as stationary turrets. 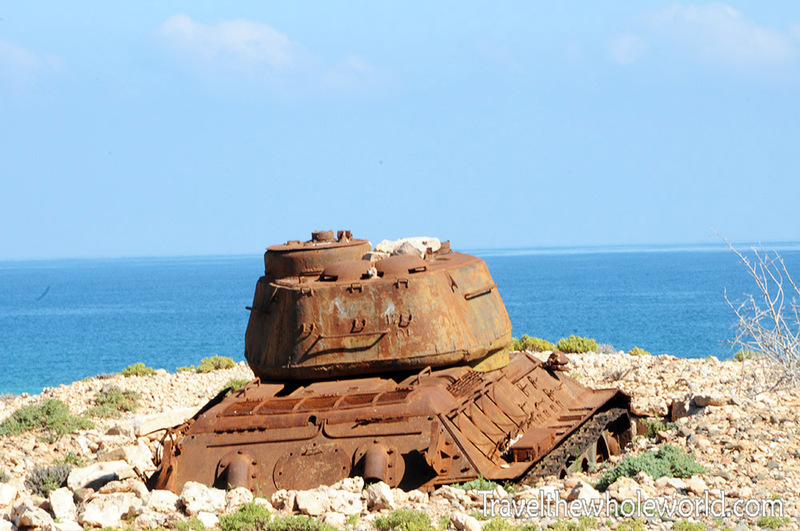 I passed by these two tanks in different parts of the island. One time I tried to approach one of the tanks but a local man prevented me from doing. Not exactly sure what was wrong with seeing an abandoned tank but being that I’m the visitor here I didn’t argue. It didn’t take long to see that Socotra is much more liberal than mainland Yemen. 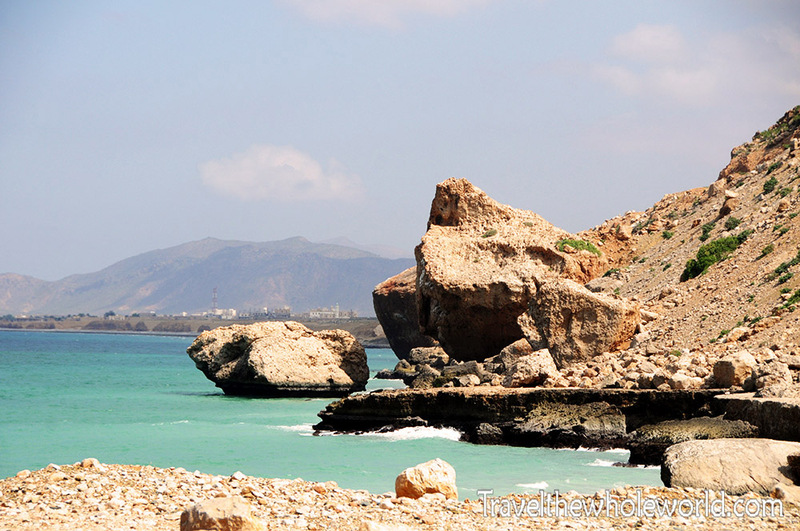 As a matter of fact, Socotra was not considered part of Yemen until 1967, and though Arabic is the official language, Socotra has its own native language that is only spoken here on the island. 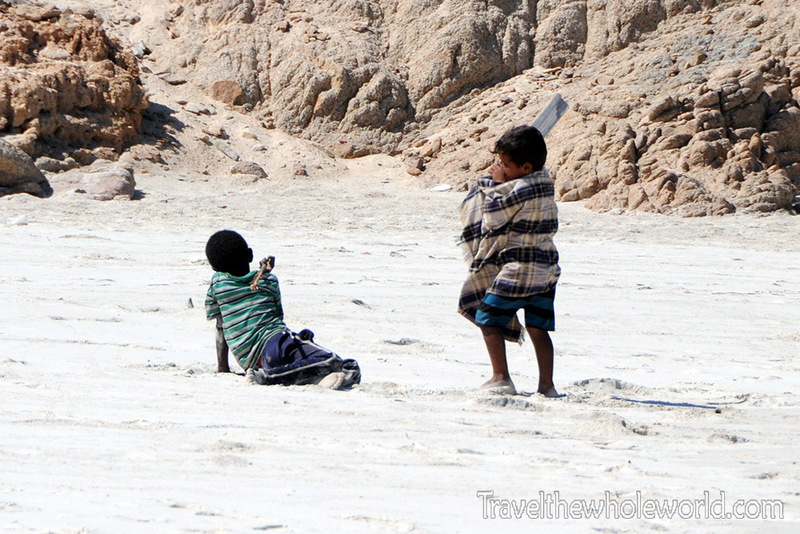 Above are some kids I saw playing on the beach, and below is a Socotra girl wearing traditional native clothing that I saw throughout the island. 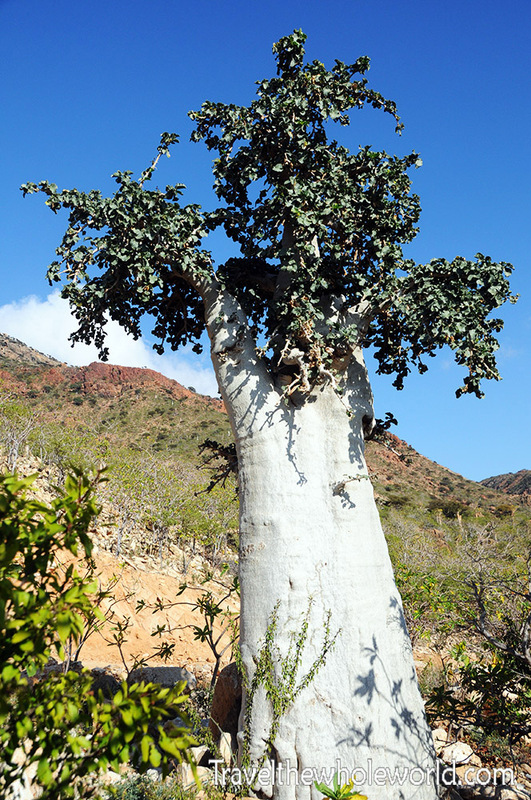 Of its countless native species, Socotra is most famous for its giant dragon trees. 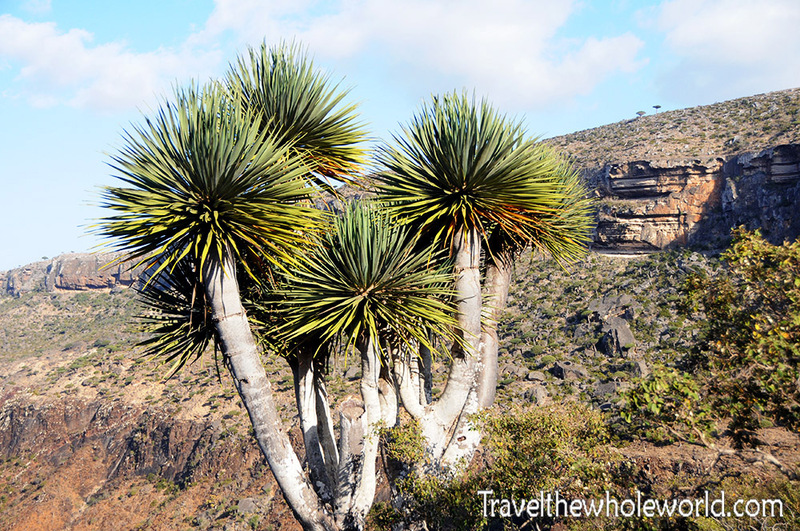 These trees are really special and don’t grow anywhere else in the world. They seemed to like the slightly elevated parts of the island, but I did see an occasional dragon tree here and there closer to the coast. 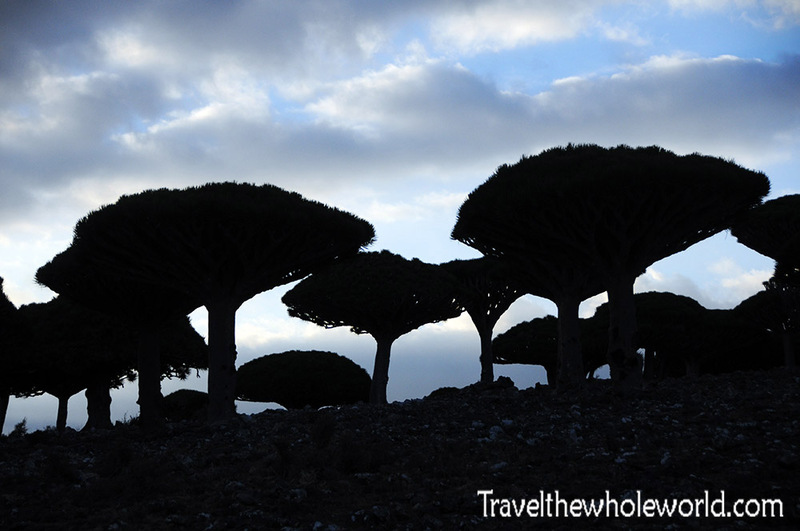 Normally I only saw a few dragon trees together, but on my last day on the island I found an oasis of them photographed below. 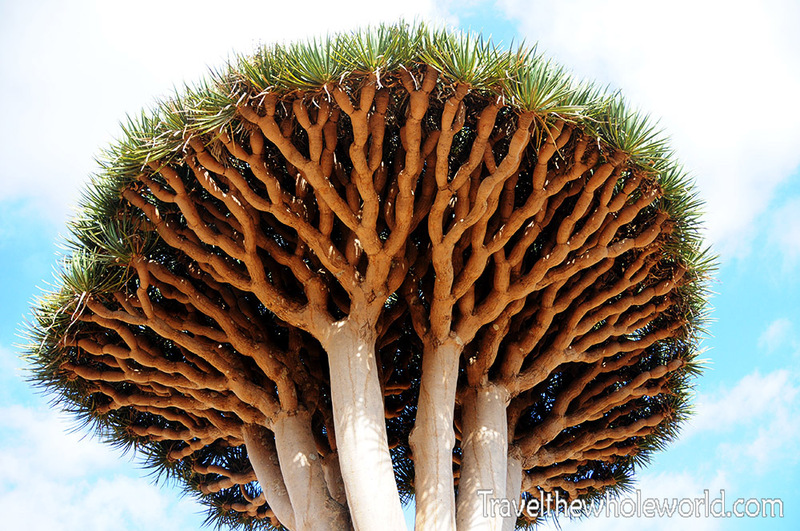 I could have seriously spent my entire Socotra trip just admiring the dragon trees. The photo above shows some of them at night, and below you can see what they look like from underneath. 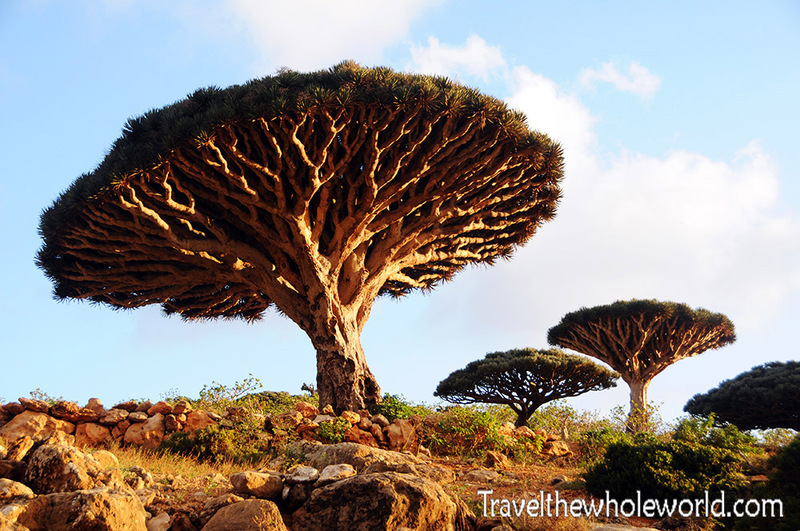 Dragon trees get their names from their dark red sap that resembles blood. The dragon tree sap is sold as medicine in the local markets and even by kids on the street. While I don’t have a photo of the red sap, you’ll have to take my word for it that it does indeed look exactly like blood! I thought for sure these trees were a completely species. As it turns out these are actually juvenile dragon trees. It almost seems like they quickly gain height, and afterwards expand outwards as they age. 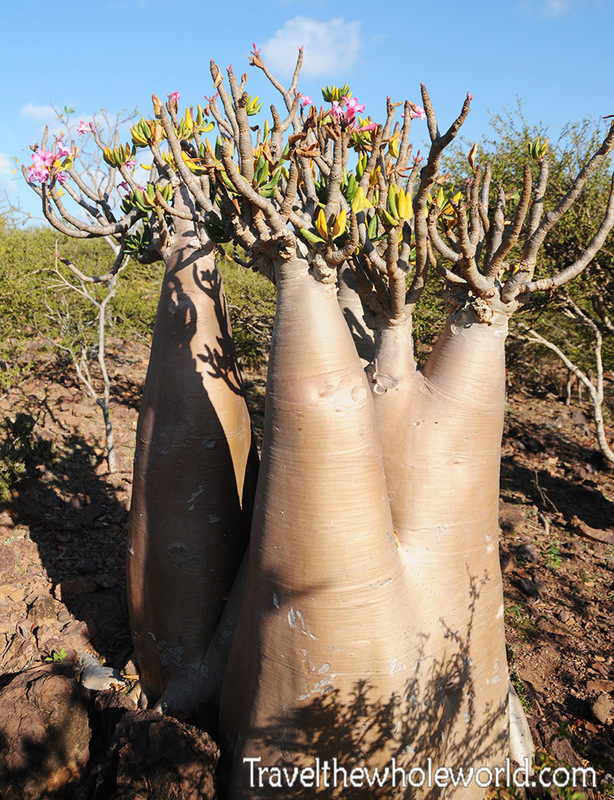 Some more unique plants of Socotra are this desert rose photographed above and below. Dragon trees flower around February which I missed, but happened to see the desert rose in bloom. The only thing I know about desert roses are that they blossom pink flowers when they get enough rain. Luckily I didn’t attempt to eat one, but I hear they are also poisonous. I’m not sure if this is the leaves themselves or something inside the wood. The trunk of these is kinda soft, so maybe people once thought they could squeeze water out like a cactus and ended up getting poisoned. This giant cucumber tree was one of the largest I saw in the island. The cucumber tree was probably around 20 feet (6 meters) in height. Unlike desert roses, the cucumber tree is able to be cut down and made into a pulp for liquids. During serious droughts locals have done this in order to feed livestock water. This almost led to the Cucumber tree’s extinction, but they have since recovered a bit. While in the island I visited to this small depression that was only a few miles inland. None of the locals seemed to know if the water was freshwater, salty, or just contaminated with natural acids. I didn’t attempt to enter it and find out, but my assumption is that it’s a sink hole and the water is almost definitely not drinkable. 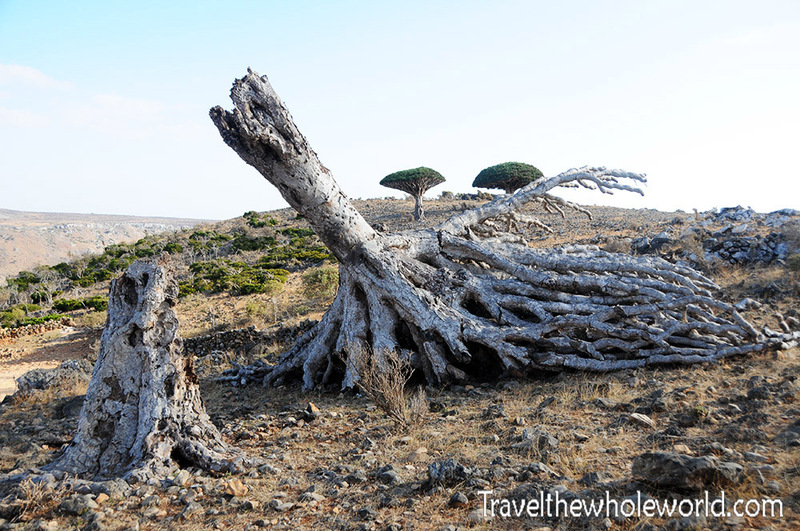 Close by the salt depression were the remains of a fallen dragon tree. I suppose it could have been poisoned by the ground, but likely died of natural causes. I’m no geologist or botanist so I’m completely making up things here! Come to think of it, I didn’t see many dead dragon trees so it’s likely that the locals use them for wood after they die. 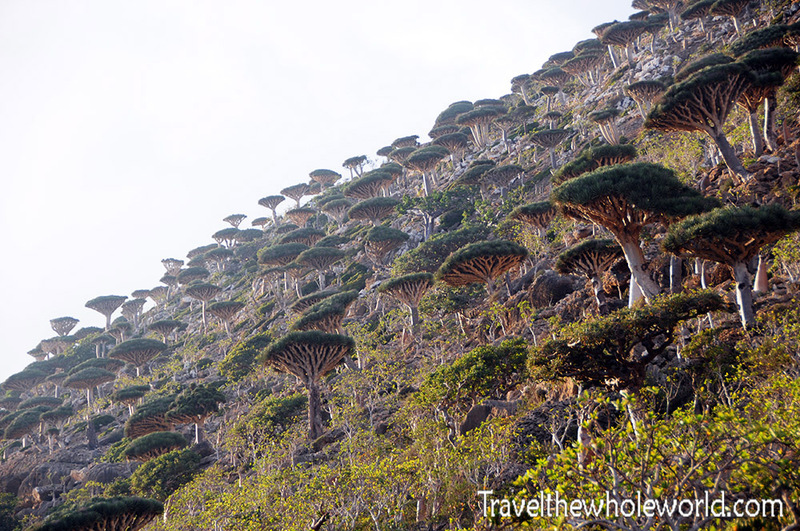 The majority of Socotra is dry and desert like and decorated with strange plants. The higher up you go the more likely you are to find terrain covered with dragon trees, while the lower you go the more desert like the landscape will be. There did seem to be one exception to the island, which was this oasis that I came to. The photo above shows a picture I took while approaching it from a distance. Even before I could see the water, I could tell that the soil here was dark and richer than the rest of the island. Despite the island being relatively hot and dry, somehow there was a freshwater stream which supplied a few small pools and created the oasis. 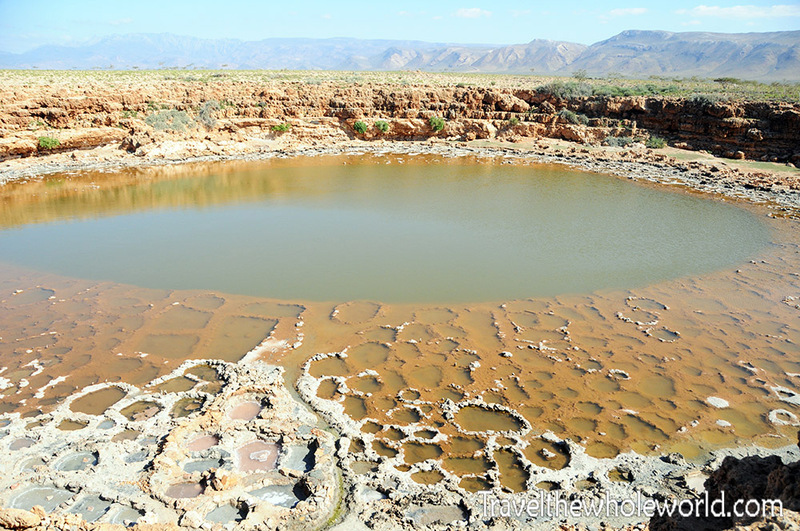 Aside from a source of water, many locals were actually swimming here as well. I tried to do a short hike and follow the stream out of the pool but ended up in a dead end. 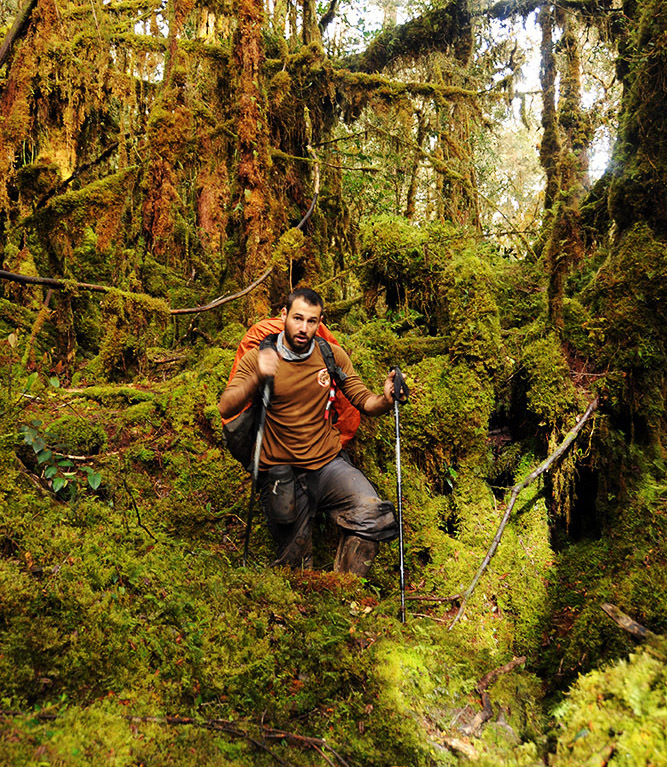 It didn’t take me long to approach a small canyon, that looked like it might require canyoneering gear to continue. The only bad thing about a guaranteed supply of water is that it welcomes lots of bugs. 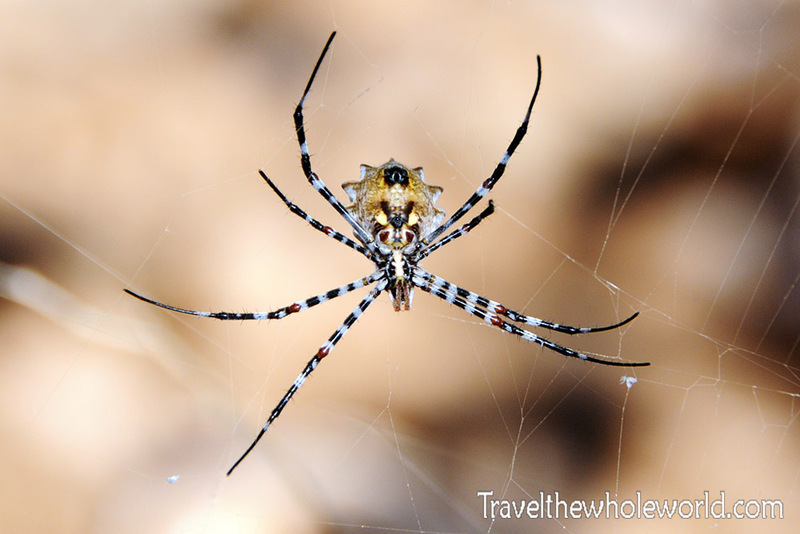 I saw a few things you’d expect like spiders, but luckily there didn’t seem to be any mosquitoes when I was there. 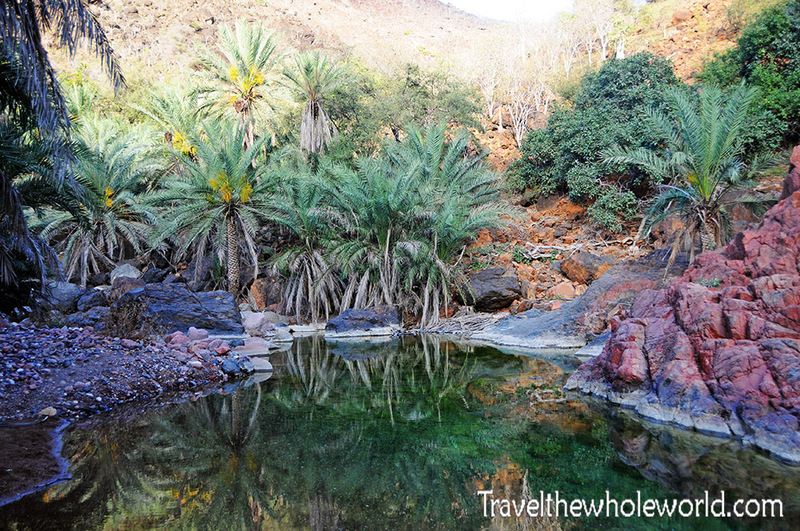 I didn’t see any dragonflies the entire time while I was in Socotra, but the oasis seemed to hold thousands of them! While certain plants and animals are limited to specific parts of the island, birds can be found all over. 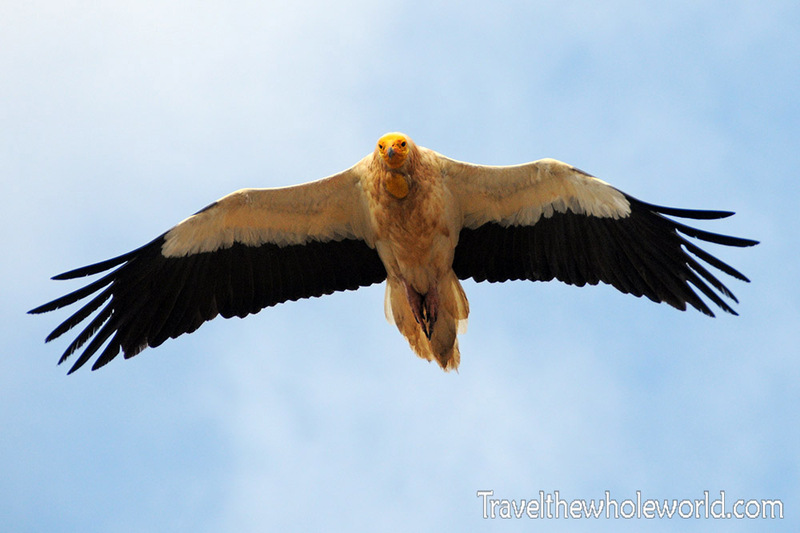 Especially these Egyptian vultures. These guys really are everywhere, even in the towns feeding off of trash. I’m not usually a fan of vultures but these were pretty amazing, especially since you can get so close to them. 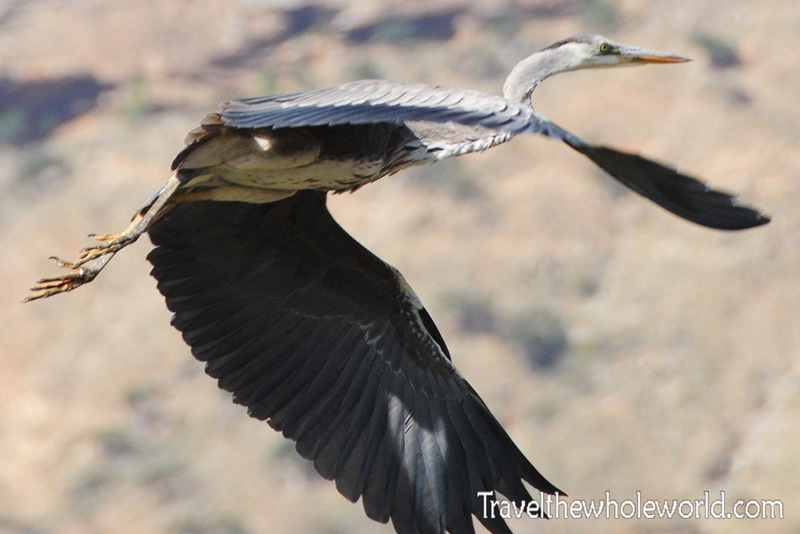 The photo below shows a heron, which I seem to see in almost every country I visit! 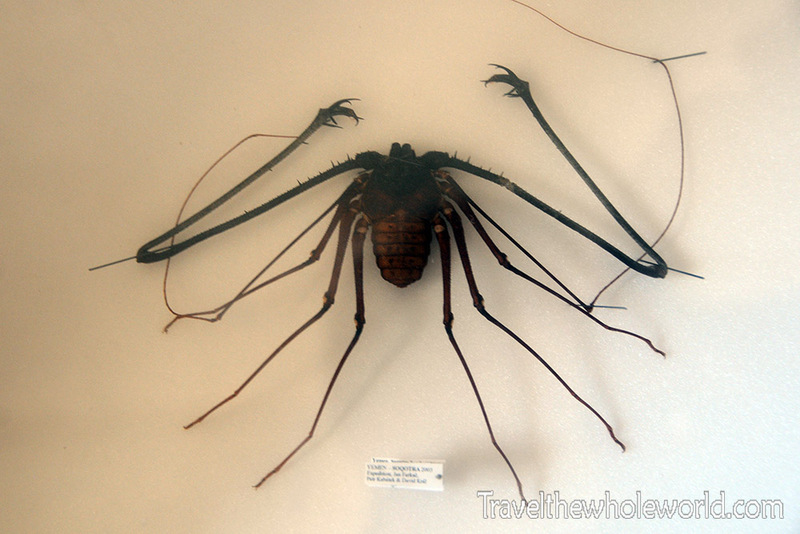 As far as insects go, this island is home to some of the ugliest things I’ve seen in my life. 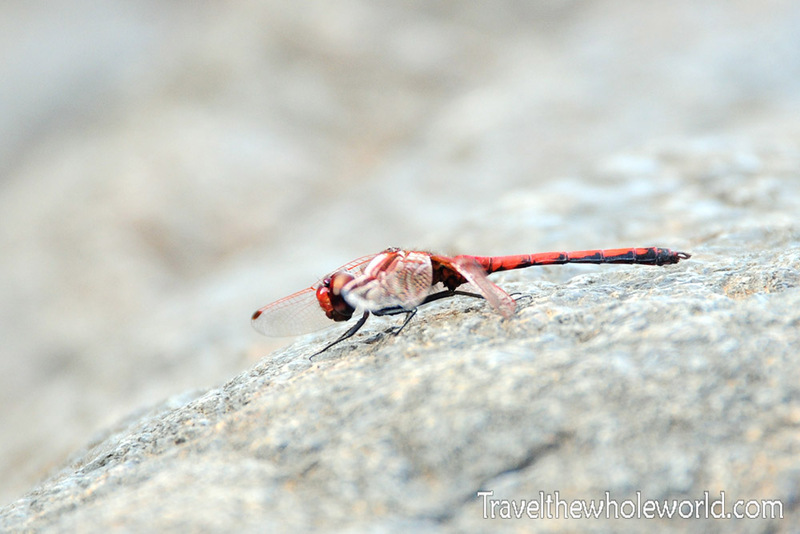 There are five endemic scorpion species here, as well as some endemic reptiles which even includes a chameleon. The easiest way to learn about these guys is at the small museum on the island which has some on display. The nasty thing photographed above was seriously the size of my face. Imagine waking up and finding that in your bed! The only native mammals on Socotra are a single species of bat. Goats were brought in by people, and they seem to own most of the island. 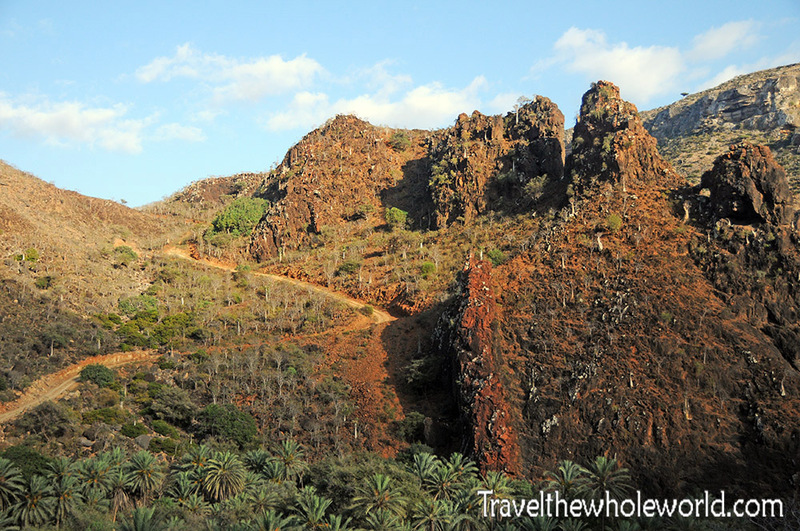 As far as plants go, 307 out of the 825 species in Socotra are found no where else in the world, and about the same ratio goes for wildlife; over 35% of wildlife here is endemic. 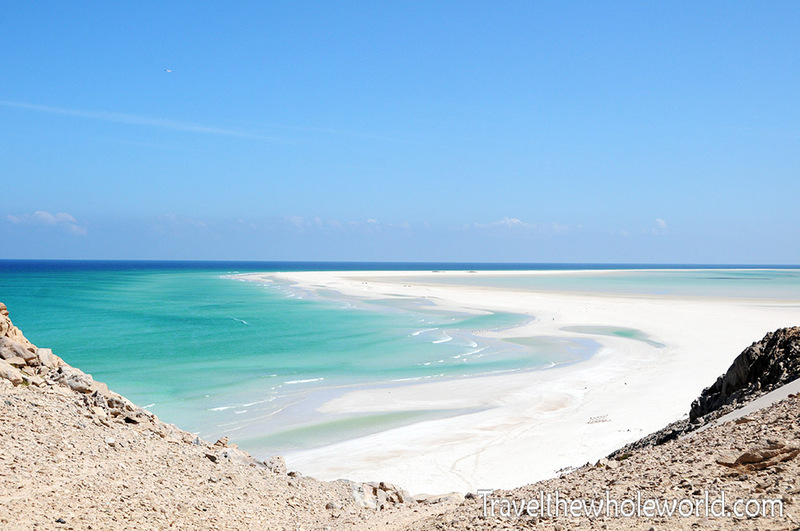 Compare that to the Galapagos island, which is up in the 40’s you can see how unique Socotra is! After I explored the mainland of the island, I spent a full day at the beach. The waters here are definitely some of the best I’ve seen on earth, and it’s a shame there is almost no tourist infrastructure here. 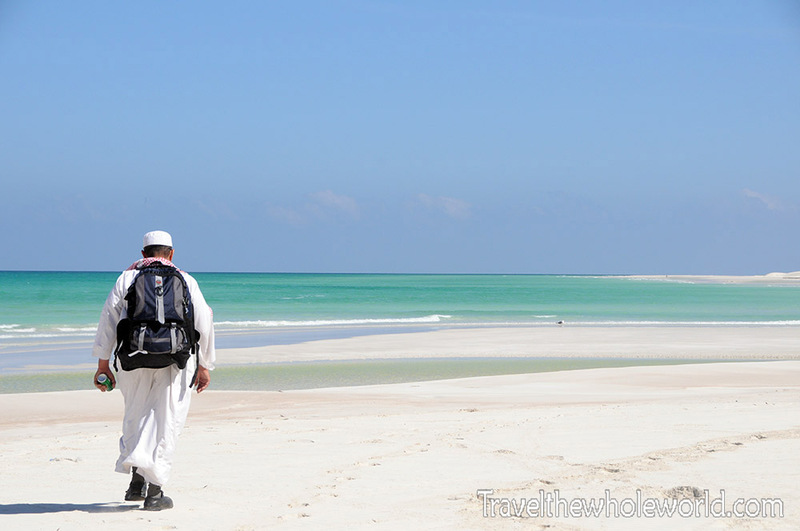 I understand Yemen itself is not seen as a tourist destination, but Socotra is an island isolated from the mainland’s problems and anyone can visit this place without any worries. The beaches here are so amazing that even the locals can’t resist and jump in. You will see a few people here swimming, but for the most part you’ll have the beach to yourself. It’s one of the few places in the world where you can have a pristine beach and be completely out of sight from other people. Before I entered the water, I took a picture of these two guys along the beach. 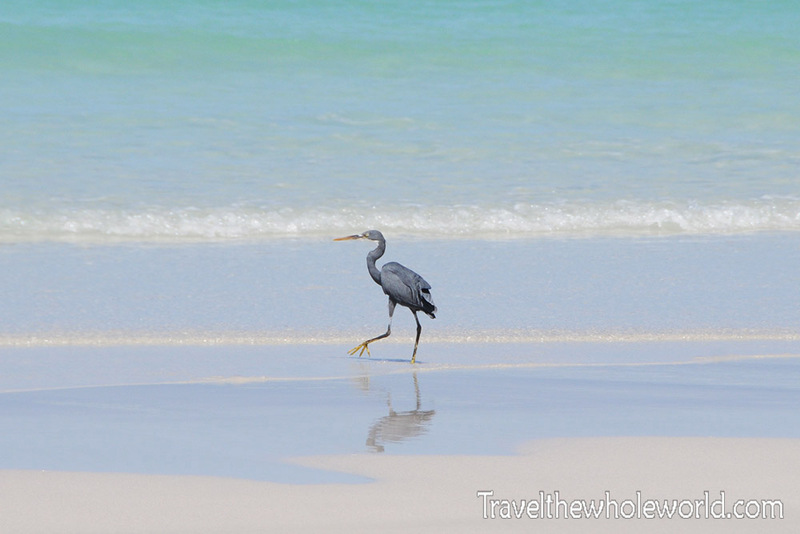 As mentioned earlier I always see herons around the world, and they were all along Socotra’s coasts. I imagine the same with this crab dominating the coasts as well. 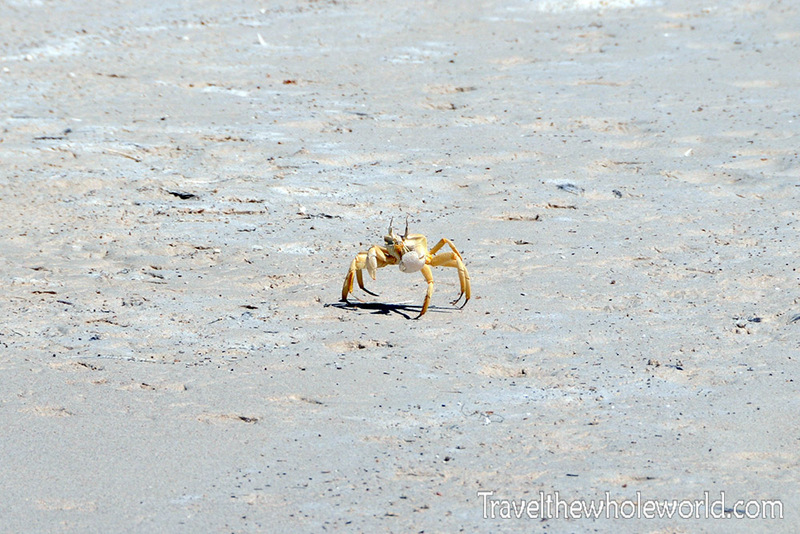 The crab was actually a giant, and made some impressive tunnels underground. Some of these were deep enough that you might suddenly fall eight inches into the collapsing sand and risk face planting! Luckily no one would be around to laugh! There’s almost an endless amount of interesting flora and fauna on the island, but taking a shore dive continues the adventure. 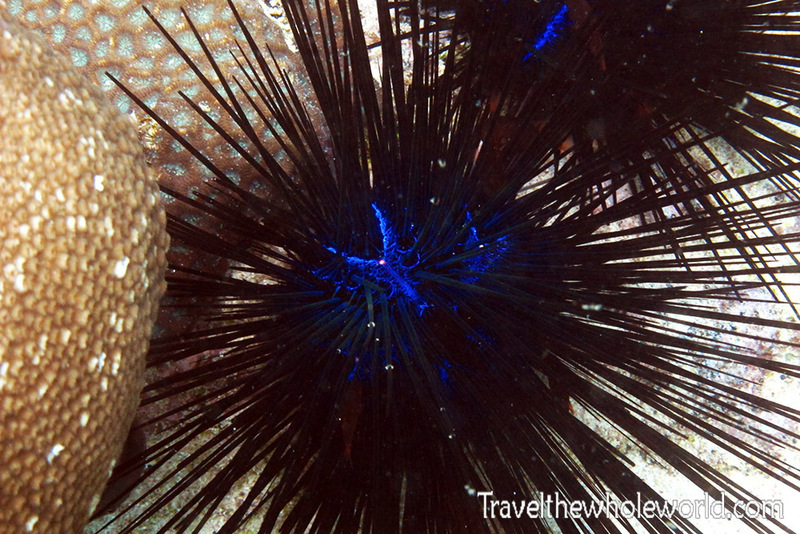 The blue spiky ball was one of the strangest types of coral I’ve ever seen. 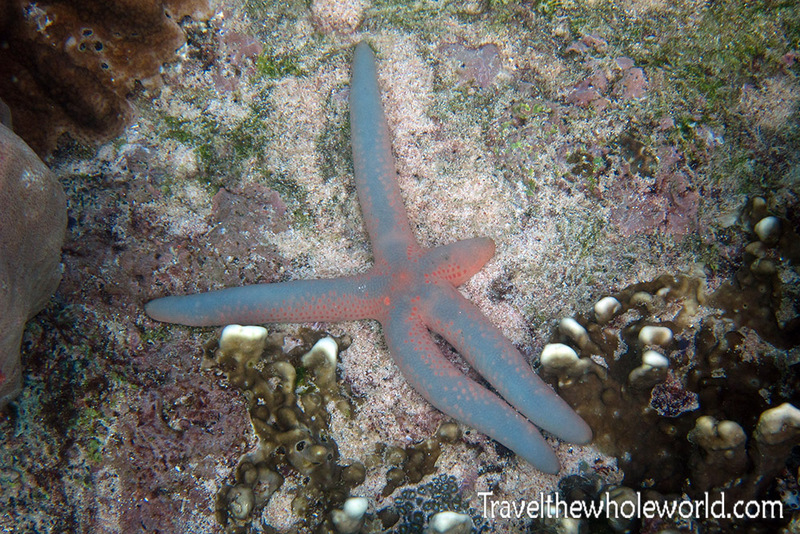 The spikey coral was easily my favorite, but next up were all the starfish I found. 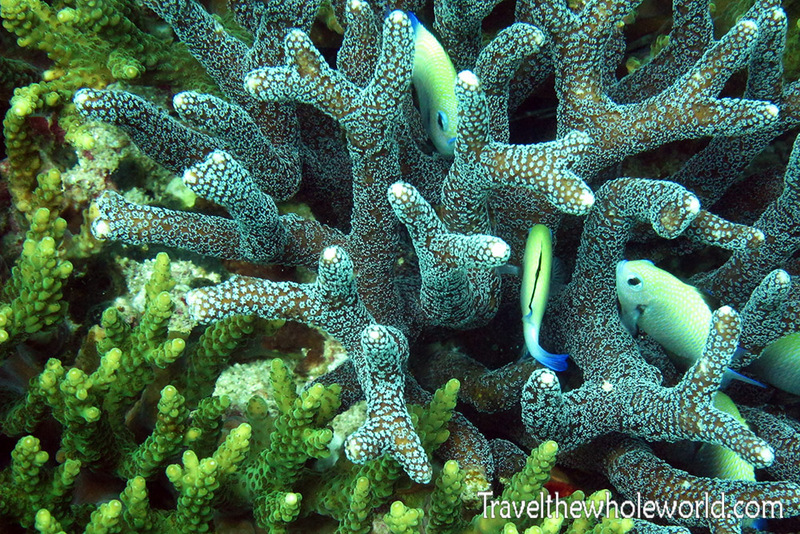 These guys were mostly blue, but like coral came with a wide range of colors. 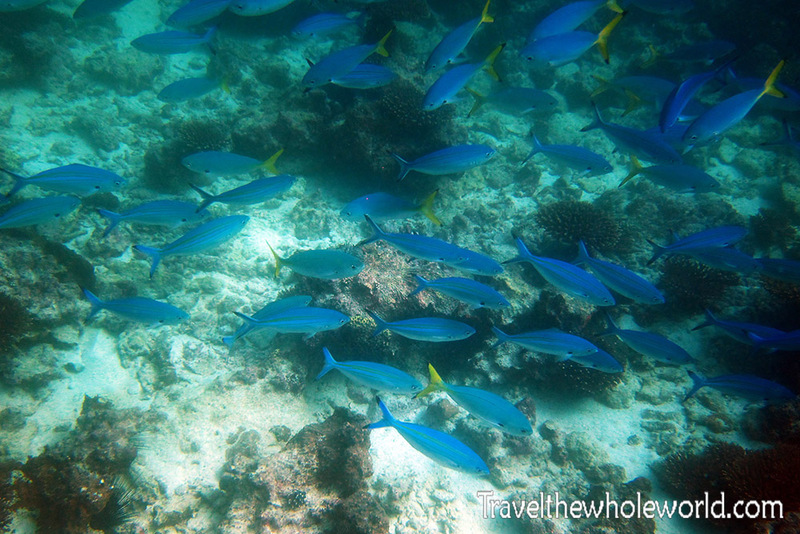 These fish photographed above were closer to the surface where I got some better lighting. I need to look up all these species up one day. 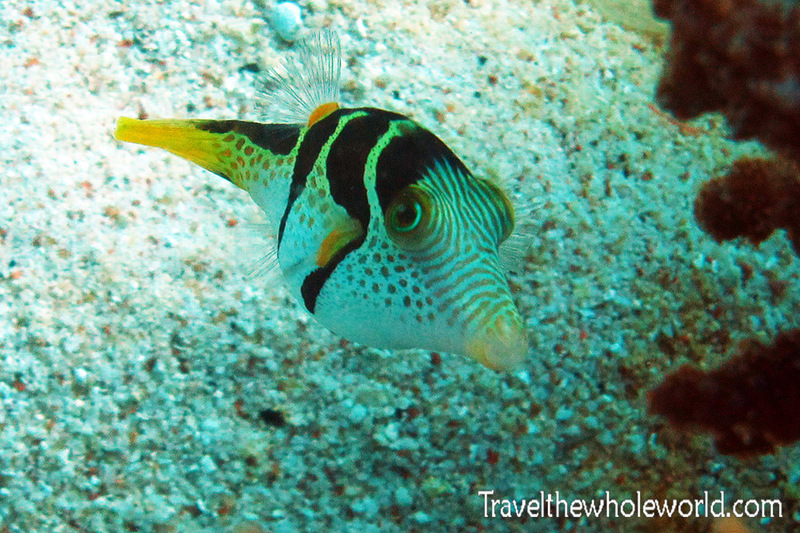 These fish were some that I usually see else where in the world when in tropical waters. 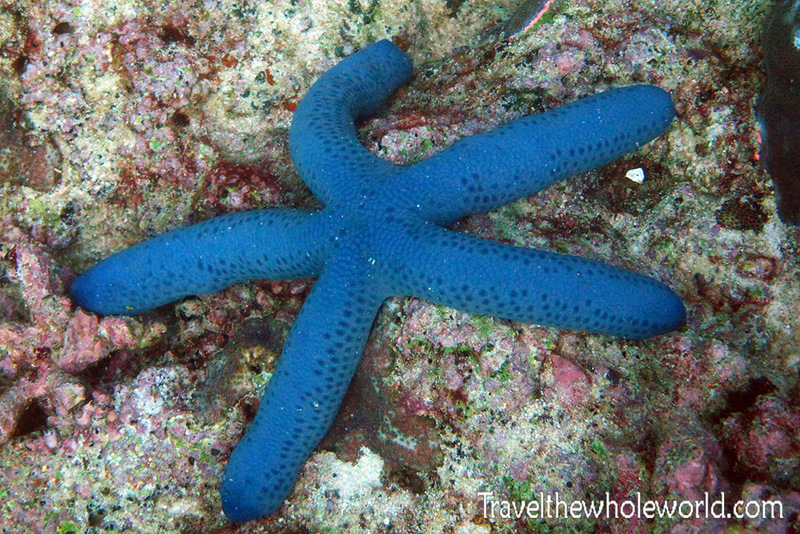 same core species around the world in tropical waters so I should learn all their names. 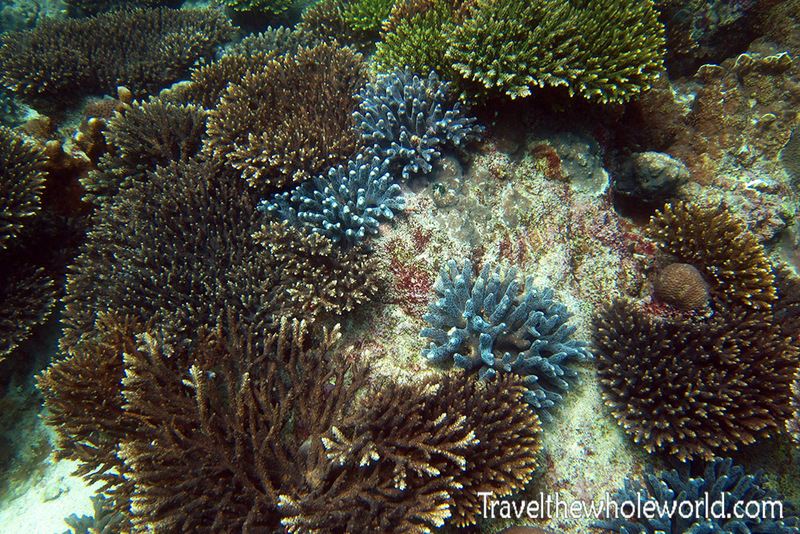 On the right are some fish hiding in coral. 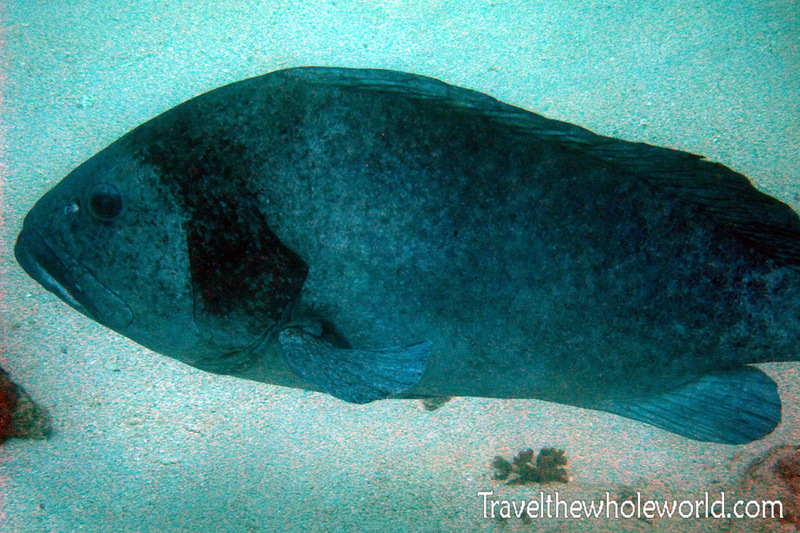 This slow moving giant was the biggest fish I came across on this dive. He was roughly half my size and didn’t seem really interested in my presence and continued on his journey. 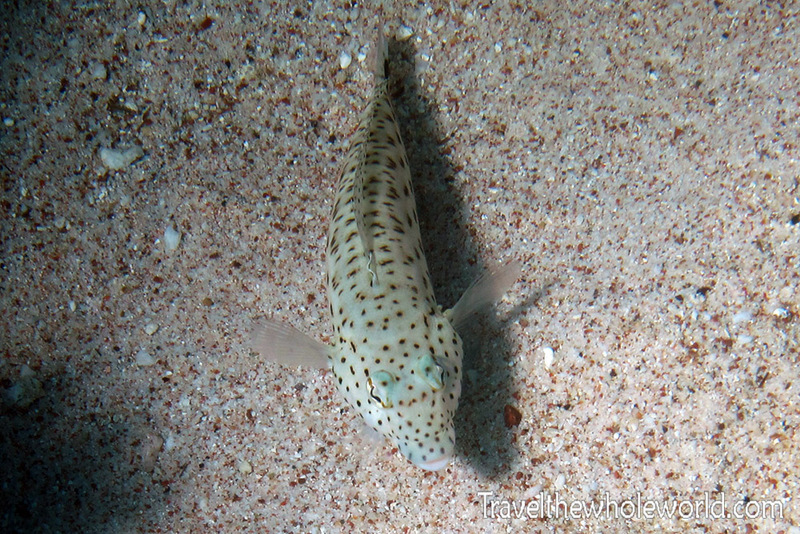 The tiny but curious puffer fish below was a more interesting encounter. I really have to take a marine biology class! 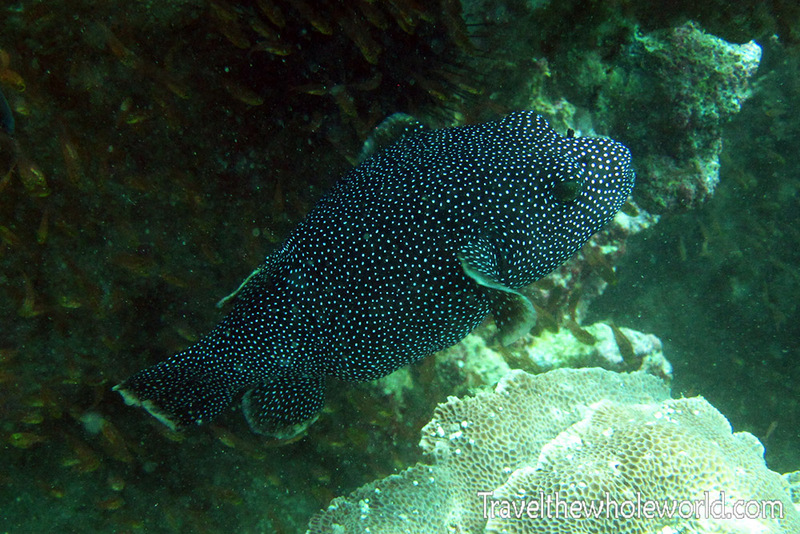 I believe this above to be another puffer fish. His blackish-blue and white spots make him look completely different from the smaller colorful one I saw, but their body types still seemed to be the same. Another sight was this large school of small blue fish below. 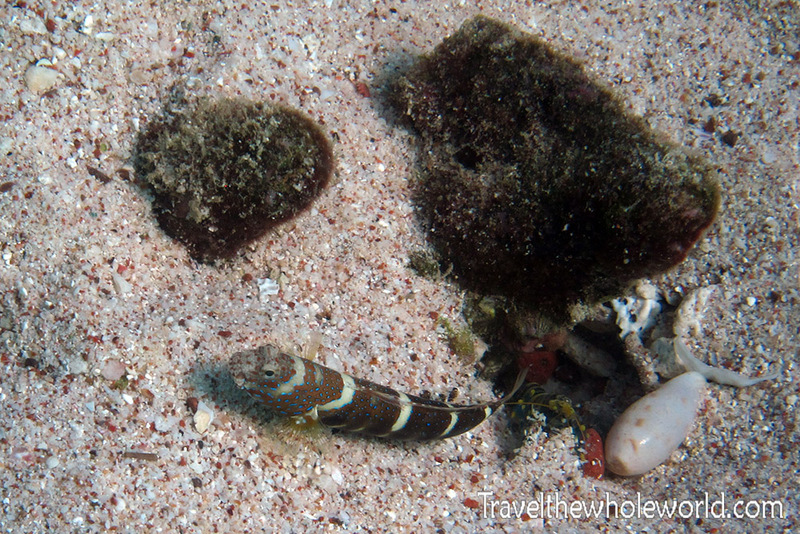 Two photos above and below of some small rock fish. I’m pretty sure the fish guarding his house below is the same exact species of a fish I saw diving on another trip in Somalia. 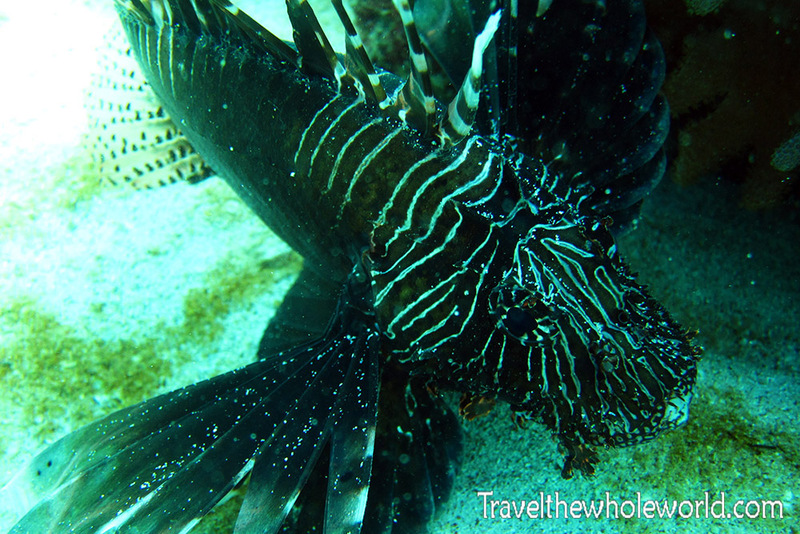 A highlight of a dive is always coming across a lion fish, at least for me since they seem like such exotic creatures. The darkness ruined the color from these photos as well, but this fish had no fear of me at all. I suppose it was confident that its poisonous spurs would keep it safe, and of course I kept my distance. 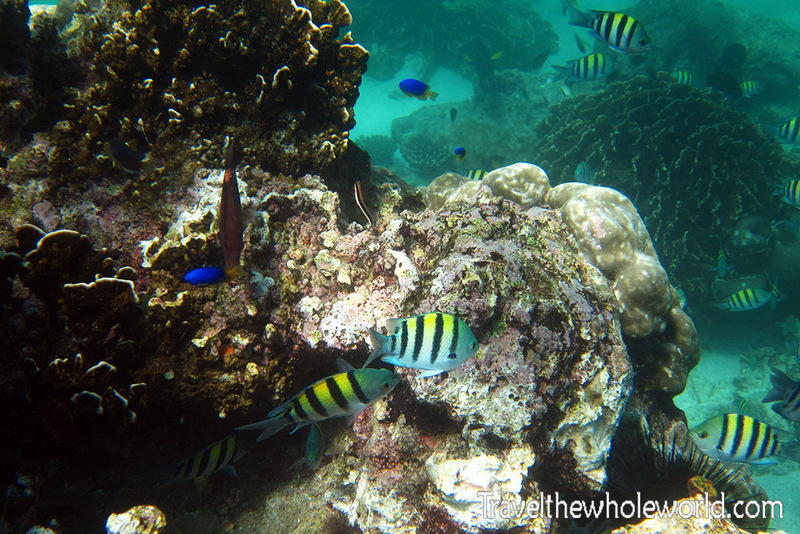 One of my most interesting encounters was diving past some coral and seeing two giant antennas poking out of a hole. They were so long I thought it was a plant rather than part of an animal. After I got a good enough look I realized this thing was a gigantic lobster. It must have been several feet in length, with its antennas being well over a foot each. 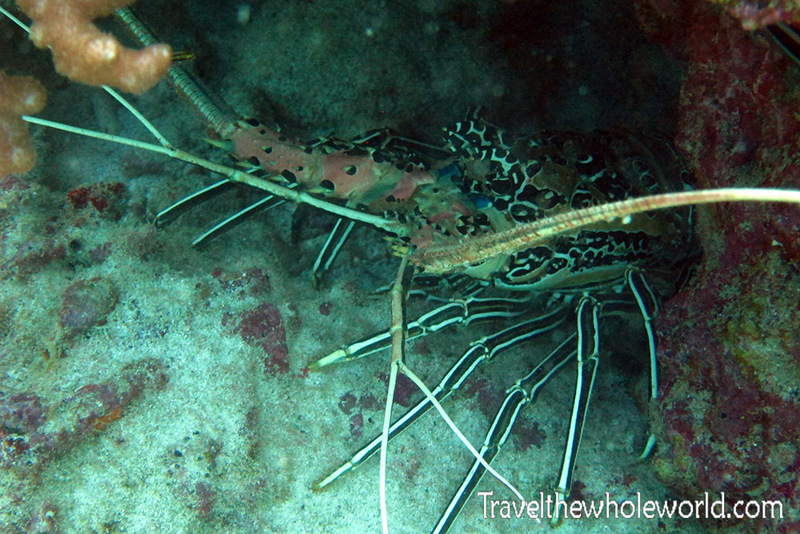 Until I saw this with my own eyes I had no idea lobsters could get so huge! Every dive I’ve ever done, the dive masters were extremely conservative. When it comes to protecting wildlife they follow all the rules and make sure everyone keeps a respectful distance. Not the dive master in Yemen though! 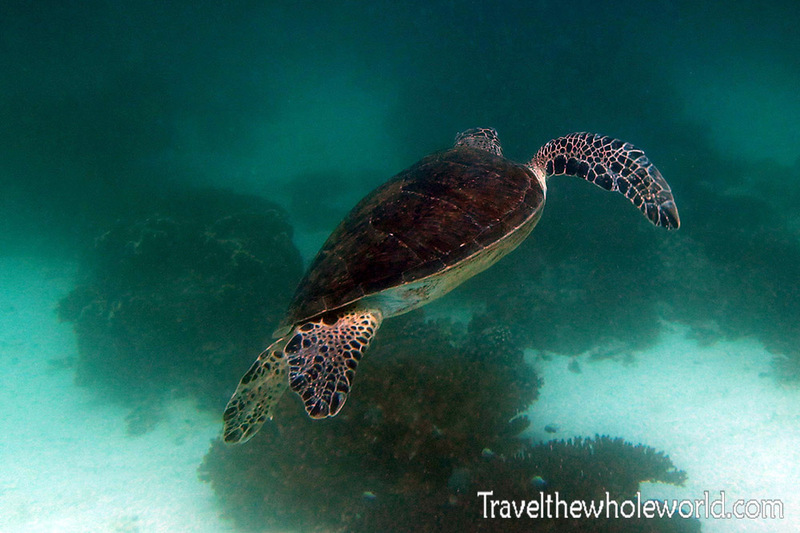 I’ve heard over and over never to touch a sea turtle because they can drown from shock. We were casually diving when the sea turtle was spotted, and then my dive master bolted for it. His arms were stretched out trying to grab it as if his life depended on it. I felt he had no chance to catch it, and of course the sea turtle was able to escape. Very sad at lighting with some of these photos! I took these only about 40 feet under water but the sky had also become overcast; not a good combination while diving. I just might have to invest in a strobe for my diving camera to avoid any disappointment in the future. Anyway though I did the best I could. 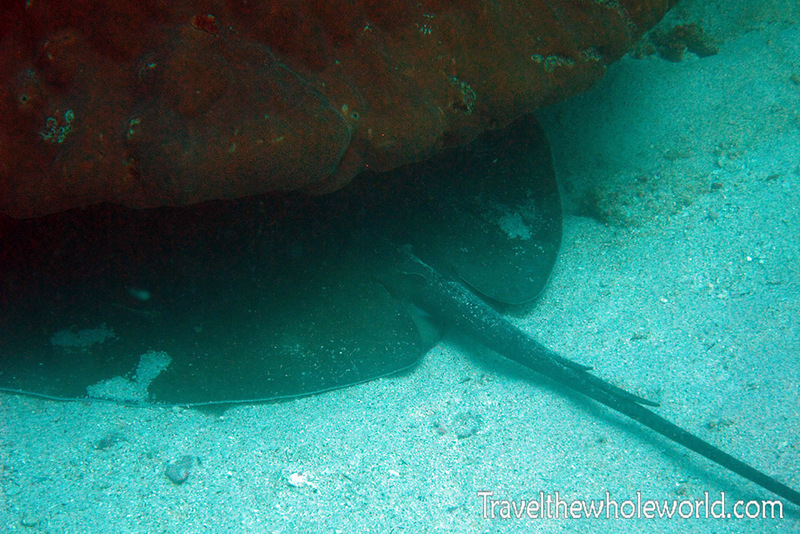 This string ray thought it could hide from me under some coral. That might not have been a bad idea, because the dive master literally grabbed it by the tail to try to pull it out of his hiding spot. Fortunately I already had taken the terrible photo, because as soon as he grabbed it there was an explosion of dirt followed by a brief struggle reducing visibility to zero.